Earlier this year, I was part of a team at Gartner that took a futuristic view of the data center, in a scenario-planning exercise. The results of that work have been published as The Future of the Data Center Market: Four Scenarios for Strategic Planning (Gartner clients only). My blog entries today are by my colleague, project leader Joe Skorupa, and provide a glimpse into this research. See the introduction for more information. Scenarios are defined by the 4 quadrants that result from the intersection of the axes of uncertainty. In defining our scenarios we deliberately did not choose technology-related axes because they were too limiting and because larger macro forces were potentially more disruptive. We focused on exploring how the different external factors outlined by the two axes would affect the environment into which companies would provide the products and services. Note that these external macro forces do contain technological elements. 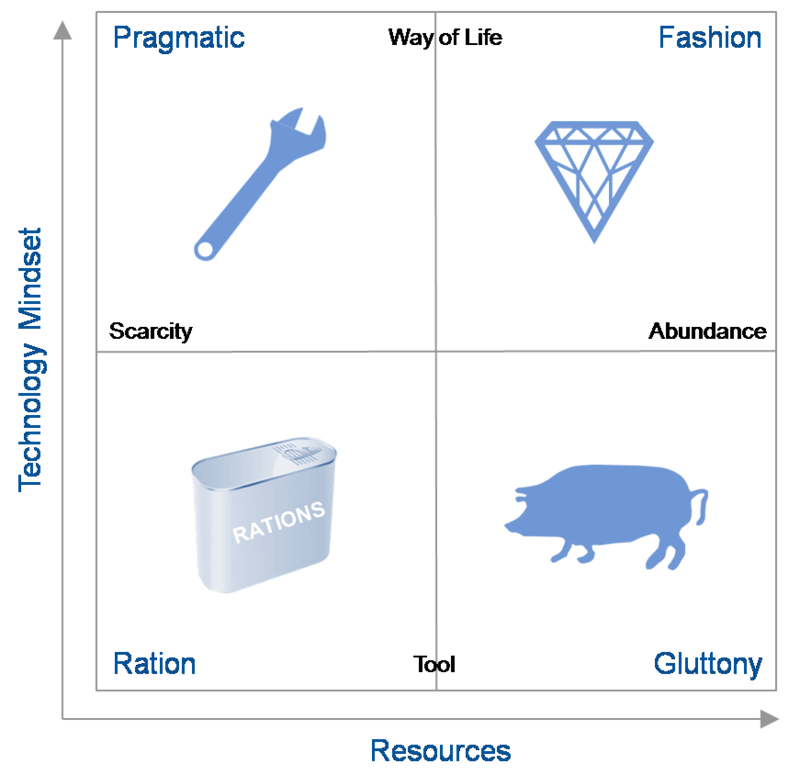 The vertical axis describes the role and relevance of technology in the minds of the consumers and providers of technology while the horizontal axis describes availability of resources – human capital (workers with the right skill set), financial capital (investments in hardware, software, facilities or internal development) or natural resources, particularly energy — to provide IT. The resulting quadrants describe widely divergent possible futures. This scenario describes the world in 2021 that is characterized by severely limited economic, energy, skill and technological resources needed to get the job done. People view technology as they used to think of the telephone – as a tool for a given purpose. After a decade of economic decline, wars, increasingly scarce resources and protectionist government reactions, most businesses are survival-focused. Key Question: What would be the impact of a closed-down, localized view of the world on your strategic plans? This scenario presents a similar world of limited resources but where people are highly engaged with IT and it forms a key role in their lifestyles. Social networks and communities evolved over the decade into sources of innovation, application development and services. IT plays a major role in coordinating and orchestrating the ever-changing landscape of technology and services. Key Question: Will your strategy be able to cope with a world of limited resources but the need for agility to meet user demands? This scenario continues the theme where the digital natives’ perspectives have evolved to where technology is an integral part of people’s lives. The decade preceding 2021 saw a social-media-led peace, a return to economic growth, and a flourishing of technology from citizen innovators. It is a world of largely unconstrained resources and limited government. Businesses rely on technology to maximize their opportunities. However, consumers demand the latest technology and expect it to be effective. Key Question: How will a future where the typical IT consumer owns multiple devices and expects to access any application from every one of their devices affect your strategic planning? This scenario continues in 2021 with unconstrained resources where people view technology as providing separate tools for a given purpose. Organizations developed situation-specific products and applications. Users and consumers view their technology tools as limited life one-offs. IT budgets become focused on integrating a constantly shifting landscape of tools. Key Question: Does a world of excessive numbers of technological tools from myriad suppliers change your strategic planning? The four scenario stories each depicts the journey to and a description of a plausible 2021 world. Of course the real future is likely to be a blend of two or more of the scenarions. To gain maximum value, you should treat each story as a history and description of the world as it is. To gain maximum benefit suspend disbelief, immerse yourself in the story, and take time to reflect on the implications for your business and enter into discussion on what plans would be most beneficial as the future unfolds. ObPlug: Of course, Gartner analysts are available to assist in deriving specific implications for your business and formulating appropriate plans.